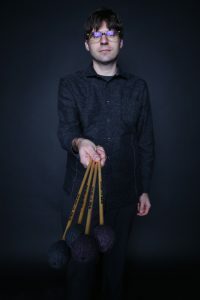 Nicholas Papador is a percussionist and composer based in Windsor, Ontario who specializes in contemporary music. He is a founding member of Noiseborder Ensemble (multimedia collective) and Marassa Duo (Afro-Caribbean folkloric influence chamber music). Papador has performed at the Transplanted Roots Percussion Research Symposium at McGill, Puerto Rico Conservatory International Percussion Festivals, the Open Ears Festival of New Music’s Environmental Rhythms, and has been featured four times at the Percussive Arts Society International Convention (PASIC). Papador can be heard on numerous CD recordings, including his 2015 solo recording Points of Departure released by Centrediscs, as well as Matthew Barney’s 2014 film River Of Fundament. An Associate Composer with the Canadian Music Centre, his compositions also appear with Keyboard Percussion Publications, Alfred Publications, Studio 4 Music, House Panther Press, and Bachovich Music. Papador has received grants from the Ontario Arts Council, Canada Council for the Arts, Social Sciences Humanities Research Council, and Canada Foundation for Innovation. Nicholas Papador is a Yamaha Performing Artist and an artist endorser for Vic Firth Sticks and Mallets, Sabian Cymbals, and Evans Drum Heads. He is Associate Professor of Music at the School of Creative Arts | Music at the University of Windsor. Papador is a graduate of Northwestern University School of Music (DM 2003), Indiana University Jacobs School of Music (MM 1999), and the University of Oregon (BMus 1997).